First came the Ouya Android microconsole. 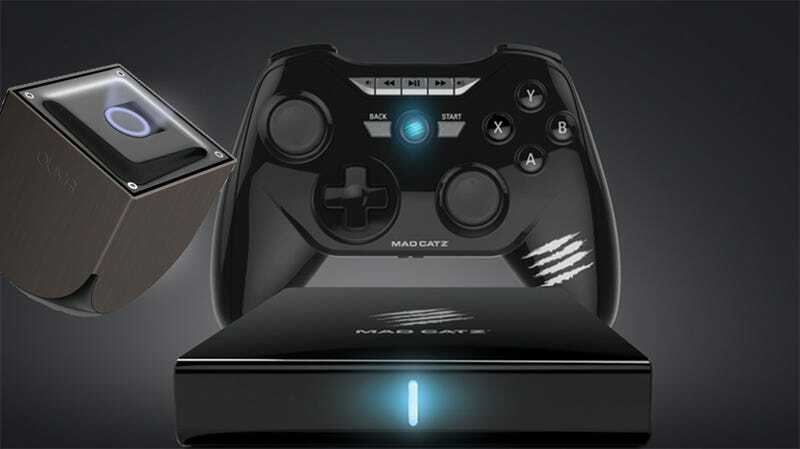 Then came Mad Catz's M.O.J.O. Android microconsole. Today Mad Catz announces the M.O.J.O. microconsole will be playing host to Ouya content. I am so confused. This is all due to Ouya's recent decision to allow the Ouya experience to be embedded in other Android devices. They call it Ouya Anywhere. It basically takes the software that runs the Ouya — the storefront and such — and turns it into an app for other devices. So the M.O.J.O., a more powerful Android microconsole (it runs on Tegra 4 to the Ouya's Tegra 3 chip), now gives Android gamers access to all of the exclusive content the Ouya folks worked so hard to acquire. Plus all the existing Android games the Ouya couldn't play. The M.O.J.O. console does cost twice as much as Ouya's physical presence, reduced today to $199, but it's far more powerful and comes with a much better controller. Who needs an Ouya now? Nobody, really. This Ouya Anywhere initiative effectively kills any reason to buy the physical product. But that's okay. Ouya CEO and founder Julie Uhrman, via official press release, is just pleased to take the box out of the console experience. "Up until now, the game console experience has been locked inside a box," said Julie Uhrman, CEO and founder of OUYA. "Together with the hardware veterans at Mad Catz, we end that. Today's announcement signifies the inception of a truly open platform where independent developers can bring their creations to the platforms where gamers actually play: everywhere." All of the enthusiasm that made the Ouya such a ridiculous success on Kickstarter has come to this. They made a console, and then ditched it to become a platform. Is this making sense to anyone else?